The Monastery is truly massive. See that blob below the main doorway? That’s a person! 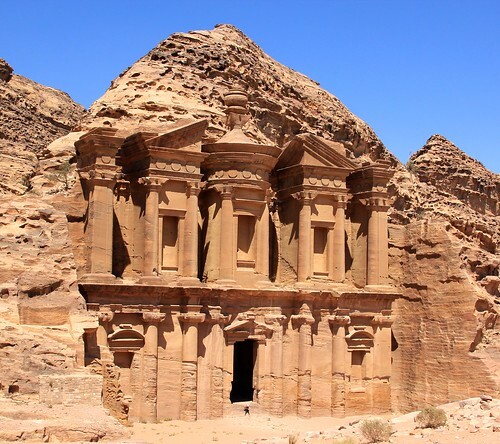 There is no doubt that the main attraction at Petra, just outside of Wadi Musa in Jordan, is the incredible stone Treasury building. However, we’d like to argue that the massive monastery is just as impressive, and if you come during shoulder season as we did, you might have it nearly all to yourselves. Both buildings have been carved right into the sides of the mountains that surround the area, and both will absolutely take your breath away. The Monastery is high on a hill at the end of the tourist section of Petra, and getting there will require that you haul yourself up somewhere around 850 stone stairs. We made it without too much of a struggle in the oppressive mid-day heat of late June, though we imagine it’s probably much more pleasant in the early morning, or during the winter. As an alternative, you can hire a horse or a donkey to cart you most of the way up. If you must go this route, I’d advise you to chose your vendor carefully since we saw more than one animal being openly mistreated, and we even witnessed one man punching an uncooperative horse in the face. Awesome photo! Did you guys go anywhere else in Jordan?? We hope to go there in the fall before our Africa trip if we have time. I hope you punched that guy in the face when he punched the horse! We also went to Wadi Rum, which is a popular desert area. Our Jordan roundup is coming soon and we talk more about it then. We only had 5 days in Jordan before our flight to India, so we didn’t get to see a whole lot.